So often I read blog posts about the wonderful small city that is New Haven. However, journalists and travel blog sites always feature the same places. While those local favorites are an important and beloved part of town, bloggers rarely dig deep into New Haven’s culture. I thought I would help visitors and new townies discover more about New Haven by sharing a different perspective. Most people don’t realize that New Haven is home to over 15 galleries. Some are hidden in office buildings, but there are dozens that stand alone and are full of amazing artwork by mostly local artists. Some examples would be John Slade Ely House on Trumbull Street, City Gallery on State Street and Elm City Artists Gallery on Whitney. The Arts Council of Greater New Haven’s website newhavenarts.org helps you explore the vibrant arts community. Theater is another great part of the New Haven community. If catching a big budget production at some of the top theaters in town isn’t in your price range, consider small theater companies like A Broken Umbrella and New Haven Theater Company. The actors live in town and are extremely dedicated to providing quality performances throughout the year at interesting locations in town. Turkish food is also happening. When you’ve had enough pizza and burgers stop by New York Times favorite, Istanbul Cafe. If you’re at the University of New Haven (which is actually in West Haven) consider Saray Turkish Restaurant and the Turkish Kebab House. Both are delicious and comfortable. There are also several libraries in New Haven. 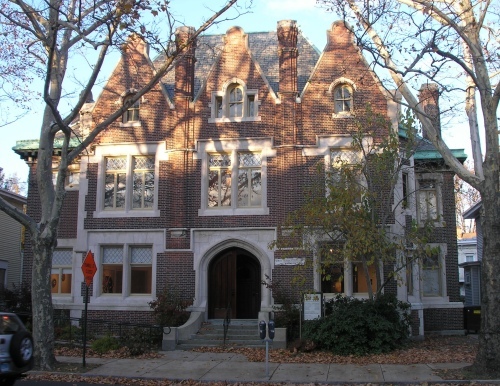 The Institute Library, according to their site is the, “oldest independent circulating library and one of the last remaining membership libraries in North America.” This hidden library follows their own rules and has quite the history. Also, the New Haven Free Public Library has many programs for families and students. Some include extremely cheap yoga classes, cultural programs, meditation and music events. Not bad for a library that has been around since the 1800s. The rooftop at Briq is also a great part of New Haven. The restaurant changes often, but the rooftop is always there. It’s the only rooftop bar in New Haven and is a perfect after work spot in the summer and spring. Another great outdoor dining experience is Kasbah Gardens on Howe Street. Most blogs always talk about pizza, burgers and coffee, but often dismiss the sweet side of town. Orangeside on Temple, which once lived on Orange Street, has the best donuts in the world. You have to get there early because they go fast! If you want to support local musicians then you have to stop by Cafe 9 and Stella Blues, both on Crown Street. They have very small stages that creates an intimate listening experience. You’ll find the best emerging artists performing there. Oak Haven Table & Bar on State Street is a relatively new spot in the East Rock neighborhood and has been holding down the 932 State Street location pretty nicely. Their farm to table style restaurant serves a tasty brunch on Sundays with great morning cocktails. Yale University is a big part of New Haven’s culture and they offer many opportunities for locals to feel part of their community. The Yale School of Music often has free performances open to the public. You can even stream them online. Street art is certainly on the rise. Graffiti artist BiP made a name for himself with his Banksy-like anonymity and over the next few months murals will pop up in places like Wooster Square and under I91. The community has the opportunity to submit ideas and be part of the creative process. While tech startups are big in New Haven, so are local blogs. The Daily Nutmeg, The New Haven Independent, I Love New Haven and the new #ARTNHV Blog provide a local perspective of all things happening in New Haven. Most people don’t even realize we have a New Haven Museum right on Whitney Avenue. You can relive the history of New Haven through old photos and attend lectures about historical figures in the city. Most of the lectures are free and the entrance fee to the museum is less than 5 dollars. They have recently extended their exhibition Beyond the New Township: Wooster Square through May 2014. The Audubon Arts District is also a must see. Places like Creative Arts Workshop and Neighborhood Music School provide workshops and programs for people of all ages. Along with The Arts Council of Greater New Haven and the Educational Center for the Arts, this community provides many art events such as gallery receptions, musical performances and in June the annual Audubon Arts on the Edge. New and exciting things are always happening in this district and this spring and summer we will see a new Chinese art gallery as well as the return of the Little Theatre. If you like Thai food go to the Rice Pot. If you have never tried Thai food go to the Rice Pot. That is all. Light up the town with the annual LAMP Festival in 9th Square or hear local bands at Fauxchella. During the winter months the farmer’s market do not disappear. They just move inside. City Seed‘s Indoor Farmer’s Market is something not to miss. They have workshops, programs for kids and even yoga. Pizza is a huge part of New Haven, but often the newer pizza places never get mentioned. While you should certainly try the staples of New Haven, don’t forget about De Legna and Kitchen Zinc. Westville also rarely gets mentioned. This part of town is home to great art sources like Kehler Liddell Gallery and is home to delicious dining and good beer. While you’re there take a stroll around Lake Wintergreen. In the Wooster Square neighborhood pizza is everything! You really can’t go wrong. However, for me, nothing beats takeout at Tony Lucille’s. The service is feel-good friendly and the slices are amazing. New Haven Living Magazine did a great write up about dining there. Neighborhood festivals can’t be missed. The Cherry Blossom Festival in Wooster Square and the East Rock Festival are 2 great examples. I am still missing many of the fun and exciting things New Haven has to offer, so feel free to suggest your favorites in the reply.